Feeling pleased that your conscientious recycling is helping to save the environment? Not so fast. Your yogurt container or takeout clamshell might end up in a dump thanks to a ban on discarded items that the United States had been sending to China for processing. This year, China followed through with its threat to prohibit the import of U.S. plastics, mixed paper and other materials that it says were turning the country into the world’s garbage dump. The repercussions from the new policy have been quick and nowhere close to sorted out in communities across the U.S.
Sacramento, California, cut back on which plastics it will pick up curbside, and will send items like egg cartoons, medicine bottles and some yogurt containers to landfills instead. San Diego’s recycling program brought in $4 million in revenue last year. Recycling could now cost the city $1.1 million. In New Jersey, Sunil Bagaria is retooling his company, moving from one that exported to China to one that will do the work of recycling in the U.S. But until that happens, recycling markets are in turmoil. China had been taking half of the world’s paper and plastic when it called a halt to the imports, tightening the contamination limit to 0.5 percent for most imports. The material it used to accept was too dirty, it said. The problems are "piling up" for San Francisco Bay Area recycling and trash collection companies trying to comply with California's strict standards. Sam Brock reports. Now no one knows where that material will go instead. While the developed world looks for new markets for its scrap, environmentalists warn that we must curb our addiction to disposable items, from plastic cups to food containers and other items that we use once and throw away. “The human footprint on the planet and here in the United States is still too large,” said Benjamin Orlove, a director at Columbia University’s Center for Research on Environmental Decisions and a faculty member of its Earth Institute. Here's how we got to this point: For decades, the U.S., rather than recycling its own material, had been sorting it, baling it and shipping it to China, where it became raw materials for new goods. But then China began warning that as part of its efforts to tackle its environmental pollution, it would impose stricter demands on scrap imports. China launched Green Fences in 2013 to enforce regulations on the quality of the imports, and announced its latest policy, National Sword, last year. It told the World Trade Organization that it needed to protect China’s environment and the health of its people. Dirty or hazardous waste mixed in with raw materials had "polluted China's environment seriously," the WTO filing said. 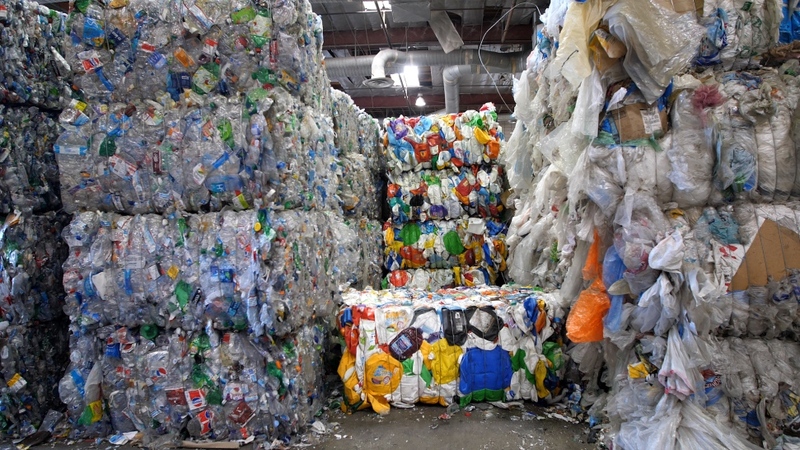 Recyclable waste waits to be sorted into plastic or paper piles at the Burbank Recycling Center in Burbank, California. China’s 40 years of economic growth has pushed the country’s carbon dioxide emissions to the highest in the world, and left China dealing with terrible smog and water and other pollution. Its economy now is the second largest of all nations, about two-thirds of the U.S. output last year. China has less need for imported scrap material, though some economists question whether fewer recyclables could result in a slowdown. At the same time China banned imported trash, it announced plans to step up enforcement of recycling within the country. “They have a mountain of plastic scrap of their own so they want to first solve their own problem before importing plastic scrap from overseas,” Bagaria said. The takeaway for him was that China’s shutoff means other countries have to take responsibility for recycling at source. The U.S. has a long way to go. Of the 258 million tons of waste that Americans generated in 2014 more than 89 million tons were recycled and composted for a recycling rate of 34.6 percent, according to the Environmental Protection Agency. China had been taking about 40 percent of U.S. paper, plastics and other recyclables but after the new restrictions began going into effect, the numbers plummeted. Recycled plastics from the U.S. to China dropped by 92 percent over the first five months of the year. All types of exported scrap, from plastics and paper to aluminum, cooper and stainless steel, fell 36 percent. The Chinese market was greater than the next 15 markets combined, leaving the U.S. with little in the way of backup. Thousands of tons of material that would have been recycled are now going into landfills instead. Some municipalities have stopped collecting items that used to be recycled and others have been stockpiling them. California is especially dependent on China. It had been exporting about a third of all recyclable material that it generated, 62 percent of that to China. The new ban is playing out by the numbers. Sacramento continues to take plastics marked with codes one through three — PET or polyethylene terephthalate which is used for soft drink bottles and peanut butter jars; HDPE or high density polyethylene, which is used for milk jugs, butter tubs and detergent bottles; and V or polyvinyl chloride, which is used in shampoo bottles. But it is no longer accepting plastics four through seven, which typically are found in grocery bags, many yogurt containers, bottle caps, meat trays and other items. Sacramento asked its Houston-based waste and recycling hauler, Waste Management, to indicate which items should no longer be included in its recycling collection before changing its recycling criteria. Waste Management spokesperson Janette Micelli said there is no "system-wide restrictions on materials" and it makes sure customers understand what the markets will pay for recyclables being collected. The company has shifted material to alternative markets, some domestically, some elsewhere. San Diego historically had exported 80 percent of its curbside material, 60 percent to China, according to the city’s Environmental Services Department. The percentage dropped to 24 percent in the first quarter of 2018. Its recycling processing contractors in May proposed suspending all revenue payments to the city — which stood at $4 million in the last fiscal year. Instead it would assess the city a $1.1 million annual cost. The loss of the China market and low oil prices together have tanked the value of plastic. The department is working to amend the contract to adjust for the effects of China’s National Sword Policy. Back in New Jersey, Bagaria’s company had been baling recyclables for shipment to China, where the material was sorted by hand. It now is investing in machinery to do the recycling in the U.S. Two facilities in New Jersey are up and running; the others are to be outfitted by the end of August. They will be able to clean the recyclables, grind them up and convert them into small pellets that can serve as raw material for new products. As disruptive as the ban is, experts hope the upheaval will spur even more innovation. Marian Chertow, an associate professor at the Yale School of Forestry & Environmental Studies and director of the program on solid waste policy, noted that in 2008 China passed a law promoting a circular economy. The idea is you make a product with material you know can be recycled rather than make a product and then figure out how to recycle it. China’s move to ban recyclables now is an enormous opportunity for the U.S. to see value in its own scrap, Chertow said. That said, change will not be easy, nor will it be quick, she and others said. Many municipalities invested heavily in single stream recycling, in which everything is put into one recycling box and separated later, a decision that may have contributed to poorly separated items. Bole says the best solution going forward would be to return to separating recyclables before they are picked up, as some communities still do: a pile of flattened cardboard preferably tied with string, mingled bottles and cans and finally mixed paper. The industry is facing a massive retooling, that in the end will be for the better, said National Recycling Coalition executive director Marjorie Griek. Recycling will survive the setback, though individuals have few choices at the moment, she said. “It’s too entrenched in society and too many people understand the importance of recycling both for the environment and for the economy,” she said. Eric Goldstein, a senior attorney at the Natural Resources Defense Council and its environmental director for New York City, said that recyclables are likely to be stockpiled in the short term until new markets are found. The key is to focus on the long term. Recyclables are like all commodities — whether corn or oil or bitcoin — and their markets fluctuate. New uses are being found for typically hard to recycle items, recycled glass in concrete, for example. Manufacturers must be brought into the loop so that the producers of products or packaging share the responsibility of recycling them, he said. Studies show that recycling and composting trash produce more jobs per ton handled than does bringing it to landfills or incinerators. A study by the Institute for Local Self-Reliance found that the removal of 10,000 tons of solid waster creates six jobs versus as many as 36 if that waste were recycled instead. “It’s very unlikely that America’s cities and towns are going to abandon recycling, which makes so much sense both from an environmental standpoint and a climate change standpoint and a jobs production standpoint,” Goldstein said. Orlove, of Columbia University’s Earth Institute, notes that recycling is not an end to itself but a way to address an excess use of resources and to curb climate change. With a recycling rate of only about 34 percent, the U.S. has not progressed fast enough, he said. New practices and technologies are emerging. Ikea will start using biodegradable mushroom-based packaging that can decompose in a couple of weeks and which Dell is already cushioning its computers with. 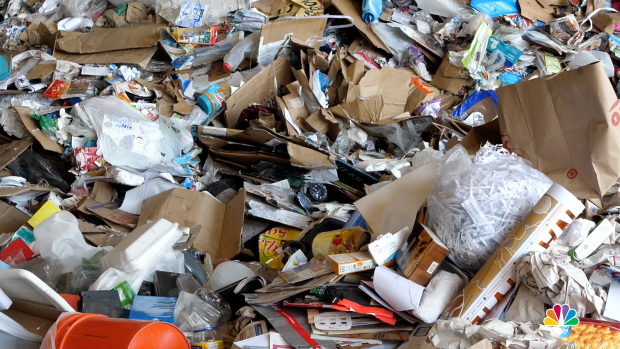 Clothing designer Eileen Fisher and Fabscrap, a non-profit in New York City, are reusing fabric, Terracycle's Zero Waste Box provides 120 different boxes to segregate waste better, and Enerkem uses municipal waste to manufacture biofuel. Apple has a robot that dismantles cell phones, while DSM-Niaga, a technology and chemical company based in the Netherlands, recycles carpets. 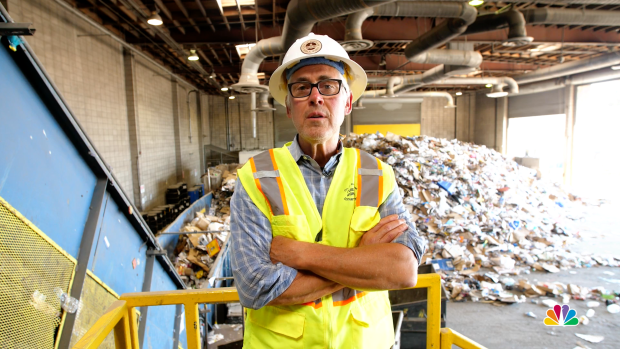 Manager Kreigh Hampel at the Burbank Recycling Center in Burbank, California. At the Burbank Recycling Center in Burbank, California, the coordinator, Kreigh Hampel, said the U.S. had lost control of its consumption. Looking forward, the situation is very unstable, he said. Jeremy Berg contributed to this article.